I went back to work a few days ago (I work a few hours a week as a distributor for a marketing company). It’s funny being in Hobart again after so long in cities wider and grander and a million times bigger and a million times more foreign. The familiarity of these places threw me. I think it’s because I’m tired. Really tired. But also because I’m different and they, for the most part, are not. It’s a funny place to be in, and I’m very aware that window of observation will be open to me for a very short time. Soon enough I’ll walk these streets and not notice them at all, not think about anything except a thousand memories of walking these same streets a thousand times before. But right now, while I’m tired and while that window of observation is open, I thought I’d show you my city, the places I’ll walk a thousand more times without noticing. It’s a good city, really. This is the mall. 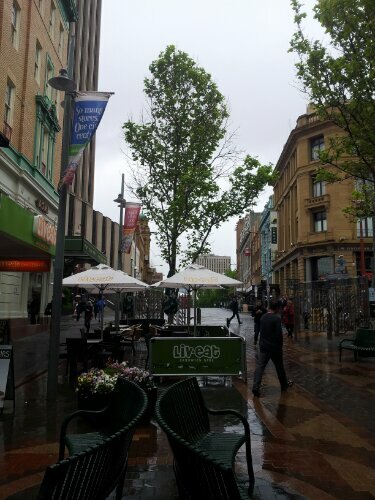 It rained today, all day, which is unusual for Hobart. Two days ago I got sunburnt. That contrast in weather is pretty normal. 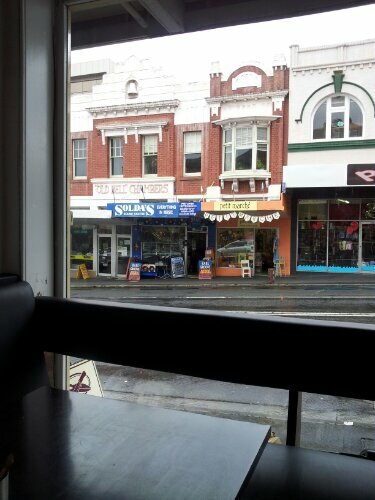 I got a coffee in town, which is pretty normal, and thought about how many old buildings there are. 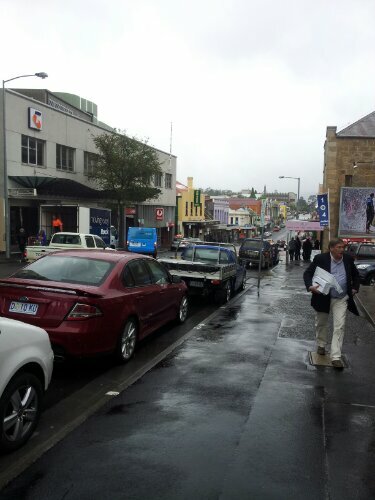 Hobart is over 200 years old, which is an infant by European standards, but compared to Calgary, a mere babe at 100 years, it’s an ancient city. We have some beautiful architecture that for the most part I take for granted. I didn’t even get to the older, genteel parts of the city. And then there’s the modernist 1950s influence. We have a lot of that, too. Those blue windows you can see poking out the back are the library, by the way. And this is it. This is looking down from the street I park my car on, down onto the main road, and beyond that is the highway. 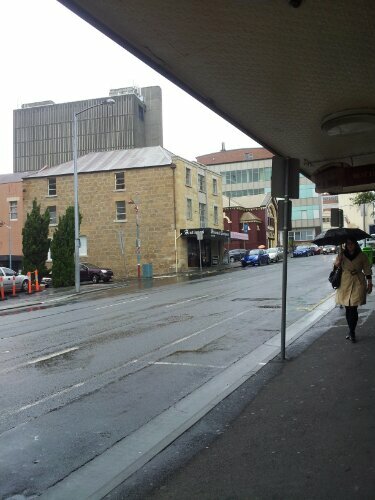 There are other, prettier views of Hobart. I wasn’t coming to capture it’s beauty today as much as it’s familiarity. This is My Hobart. Two lanes of traffic. 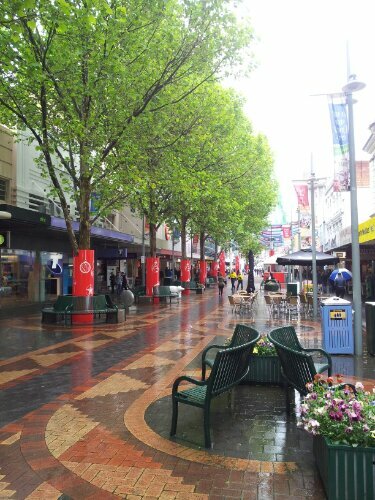 Peak hour that lasts five minutes. The mountain that comes and goes with the weather. These are the scenes that I know like the back of my hand. To tell you the truth it’s good to be home, but at the same time familiarity makes me a little sad too. It makes me, strangely, nostalgic for places that are different. I’m tired, really tired. And it’s good to be home. But to tell you the truth, today I’m homesick for America.